Missed Food tip Friday, guess we'll catch up to that next time. Alright, you'd think that I would have learned about the benifits of using sunscreen by now?! 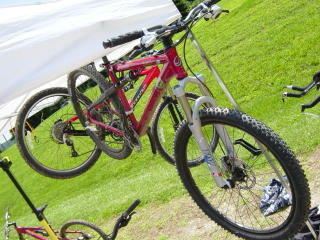 After 2 cups of breakfast blend I packed the Subie and headed to the local county park for today's Jamis Bicycles demo. The weather was great, no humidity, slight breeze, sunny and lots of people looking to get their ride on with Jamis bikes. Road and mountain weapons for all to ride. 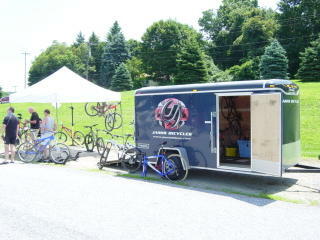 The demo trailer was stock with mostly full suspension rigs. Dakar XC and XLT platforms with Expert, Pro and 1.0, 2.o repectfully. Hardtails represented by the Dragon and couple of Komodo 2.0. Rider's needs for a full suspen ranged from comfort, aggro, enduro and bi-curious. (on the fence about leaving the hardtail world.) The Dakar platform has been on the trails for 10 years. As side from a rear pivot relocation (thanks to Specialized and litigation) and some retooling, they have been utilizing the same suspension design. Unlike other companies that have been redoing their full susp every 5 years. Having raced the Dakar 10 years ago, I can say that it's a very capable rig. The Komodo's are made for hucking and hard trail riding. Sort of like an XLT w/o the rear shock. Everyone was smiles about the hydraulic brakes, one finger is all you need y'all. Dakar Expert and Pro models come with carbon brake stays, nice touch along with a carbon swing link at the rear shock. Carbon with your bike on purpose....not 'cause you single pivot big blue bike rear cracked and you THEN get the carbon as a warranty replacement. Dual control levers were received better that I had expected too. Imagine Shimano road lever laying sideways for mtb. These bikes still blow my mind with their component spec for dollar. A handful of the local road race team came by to check out the Xeniths. With one of their volunteer team riders out on one, we would really get the straight answer of Jamis's cred with a race prep bicycle. He returned with a positive review of his test ride. Cool.